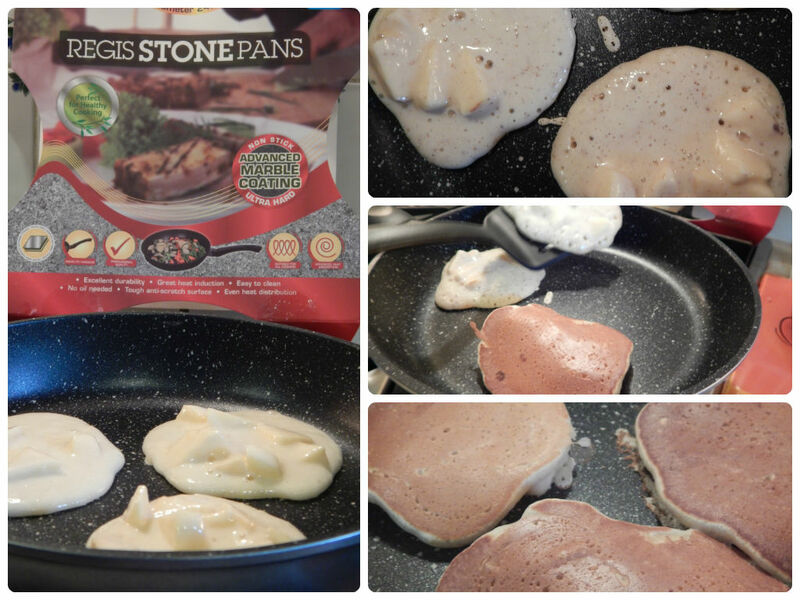 JML challenged me to create a healthy fried breakfast using their new Regis Stone non-stick pan. I’ve heard about non-stick pans before but to be honest they never seemed to work as advertised, so I was really keen on trying Regis Stone. 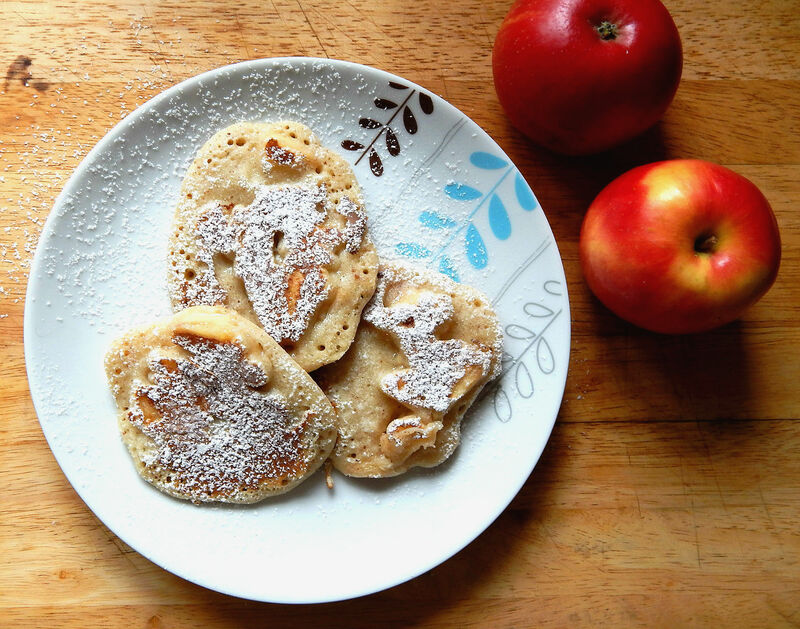 This led me to a new cunning idea – I will make Apple & Cinnamon Breakfast Pancakes! No fat in them so I will actually be able to make a fat free breakfast and thus test if the pan is really non-stick. Perfectly! I am quite amazed by the Regis Stone pan. I must admit I was tempted to add just a drop of oil… just in case… but I didn’t. My pancakes were cooked without any fat whatsoever and the pan didn’t even require a wash afterwards. If you would like to try my breakfast pancake recipe, this is what you need and how you make them. Separate the eggs whites from their yokes. Place the whites in a separate bowl, ready for whisking. Place the flour, sugar, salt, soda, cinnamon, milk and both yokes in a large bowl and mix all ingredients with a whisk until everything is well combined. Wash, peel (or not), core and dice your apples. Add them into your main mixture. Whisk the egg whites until they are able to form firm peaks and then gently fold them into the main mixture with a metal spoon. Now, you are ready to start cooking. As I used a Regis Stone pan, I had no need for any fat. I just grabbed a good spoonful of my mixture and place it in the preheated pan. It should take you just over a minute for each side to cook and brown nicely. Serve warm after dusting with icing sugar. Oh, and if you are in need of a new frying pan, I would highly recommend Regis Stone! We are going to order a large 28cm one. This is really one amazing frying pan! * I received one 24cm Regis Stone pan for free as well as shopping vouchers, to cover the cost of the ingredients, but all opinions expressed in this post are honest and my own. Yum! I love apples and cinnamon, so this is the perfect idea! Can’t wait to try these for breakfast. I can’t believe you didn’t have to use any fat! These look great and apple and cinnamon is one of my favourite combinations in anything!! The pan is brilliant; and the fact that it is so easy to clean is just fantastic. I hate scrubbing pans when food sticks to it. I love non-stick cookware. We make vegan pancakes all the time, with homemade syrup. My girls pretty much take care of this because I let them cook easy recipes from time to time. They are inheriting my love of cooking. I have a crop of apples from our tree, so I am definitely going to make these soon. I hope you will like it as much as we do. Love the idea of apple pancakes. Healthy but tasty too. We’re going to make these this weekend. I’m quite amazed there’s no oil needed. I definitely need to have a long into this pan. yum mine love pancakes for brekkie, we often have a banana and egg pancake. 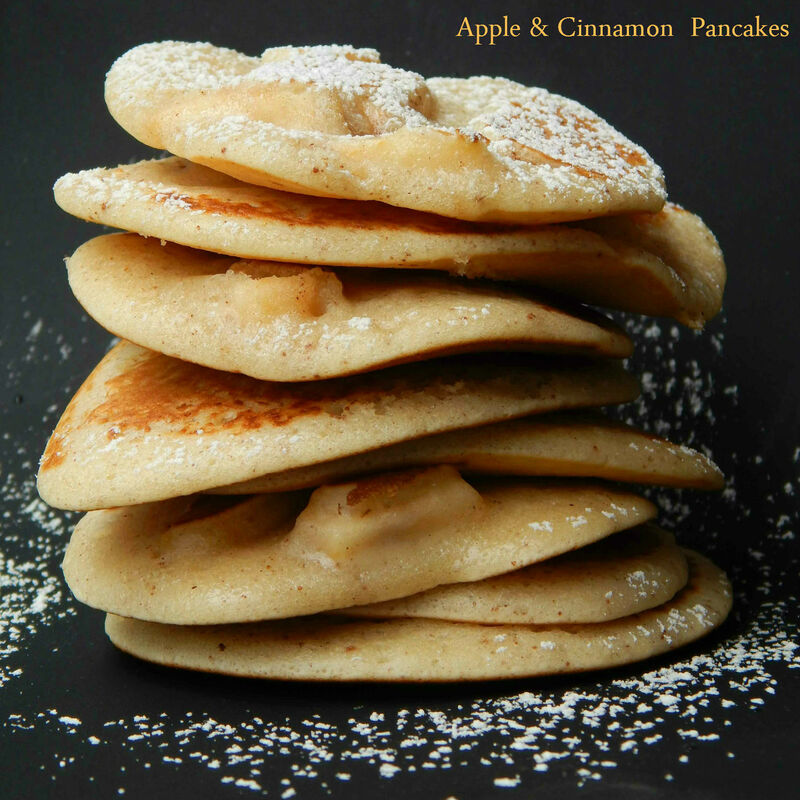 Apple and cinnamon pancakes sound absolutely delicious, a lovely combination. The pan looks great, I bought a non stick pan not too long ago and it never stayed non stick for long. The pancakes looks delicious! Hubby and I have been looking at regis stone pans for a long time now. Think we definitely need to invest in one! This saucepan looks magic! Lovely level pancakes – can’t go wrong with those, by the looks of it. I feel like I am copying now but I am not – I also opted for pancakes for my healthy breakfast lol – great minds. Yours look delicious. I am in desperate need of a new pan so I am going to check this one out. Those pancakes also need to be checked out by me too 😉 They look delicious! I love apply and cinnamon together, I bet those are absolutely delicious!